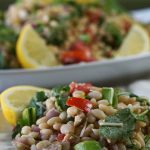 Yummy deliciousness and creamy crunch in this Mediterranean White Bean Salad - you're going to love everything about this one - you can serve it cold or room temperature. Perfect for a buffet or light lunch! While the beans are cooling, chop the vegetables. Dice the onion and tomato. Clean the sugar snap peas and slice them into small bite sized pieces on the diagonal. Grate the parmesan cheese. All these ingredients along with the parmesan cheese to the bowl with the beans. Make the vinaigrette - zest & juice one lemon. Add the lemon juice & zest to a jar with the olive oil, salt & pepper. Shake together really well. Pour over the salad and mix to combine. This salad can be served at room temperature or chilled - perfect for a bbq!